TARANIS window for LCD protection. 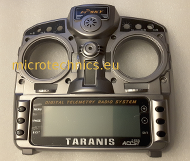 Haptic module for TARANIS transmitter. 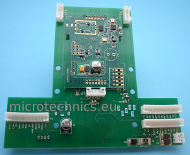 Main Power switch with board for TARANIS-B version, includes controller chip for 2Ah battery charge. Also available in this category, the second version called Slider V2. Main Power switch with board for TARANIS-A version, includes controller chip for 800mAh battery charge. Complete rear casing includes welded antenna, Charging connector, and Led , with carrying handle. Flat cables, sliders, switches and slot cover are not included. All new parts, no second hand, protective film still on LCD cover and 'FrSKY' Sticker. New part removed from new transmitter, was reserved for after-sale service but was never used. Also available with rear casing, antenna being already welded, see above.